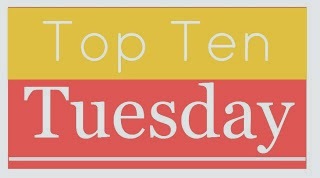 Top Ten Tuesday is a weekly feature at <a href=”http://www.brokeandbookish.com/p/top-ten-tuesday-other-features.html”>The Broke and the Bookish</a>. 1. Minimize physical book-buying and purge physical books. I’m realistic enough not to think I could buy zero books in 2014, but the shelves are out of control. I’m trying to be mindful of books I bring into the house, make better use of the library, and wade through the horrifying number of NetGalley titles I still need to read. 2. Write 500 words a day. Any 500 words will do. It would be great if I wrote more than that, or if I wrote on the same novel every day so I made actual progress, but this year, I’m just going for WORDS ON A PAGE. 3. Get through the backlog of Netgalley titles I have for review and stop requesting mildly interesting ones. I always think, “Oh, that sounds good,” and then realizing it’s self-published (and not one of the rare gems), a genre I don’t read (hmmm, that description didn’t say it was Christian Lit), a blah mystery (there are plenty of good mysteries out there), or something else that makes it unappealing. Again, mindfulness is key here. 4. Post here at least three times per week, including Top Ten Tuesday, which I always enjoy but don’t always take the time to participate in. 5. Get a good book blog profile photo to use. I read all the time. It’s sort of shocking I don’t have a photo of me reading a book. 6. Pay attention to publication dates. I already have a few blog posts scheduled with reviews on the book’s publication date. Publishing a review months before release is really not helpful. 7. Visit more book blogs. I need to minimize physical book-buying too. I just need to read what is already sitting on my shovels. BUT THEN YOU WALK INTO A BOOKSTORE! AH! My backlog of Netgalley titles, is sad and probably really upsetting to publishers. BLAH!